Some weeks ago I made quick visit to Augusta, Georgia, to give a lecture and have a public conversation and forum at the Augusta-Richmond County Public Library in downtown Augusta. The evening was moderated by Dr. Jeffery Thomas, pastor of the Trinity CME [Christian Methodist Episcopal] Church, a historic black congregation in the city. It was my first visit to the city. I’m not going to lie; I wasn’t thrilled with myself for booking this particular venture, especially after I learned the exorbitant plane fare from COS to AGS was going to eat up my honorarium and then some, and after the last year of quite a bit of guest lecturing and seminar-ing all around the country, I was a little tired of plugging a certain book by one Edward J. Blum; but I agreed to do it back in the spring, so there I was driving to the airport at 4:00 a.m. for my 5:50 flight to Atlanta and then Augusta, mostly hoping I would be done with that coming evening’s events in time to retire to my room and watch Game 7 of the NBA finals. As is surprisingly often the case in life, that which you get dragged into and just barely make after not being able to come up with a decent excuse to miss, turns out to be the thing that you would never have want to missed, one of those gifts life gives you. Many years ago, the single greatest jazz performance I have ever seen, at the late and lamented Koncepts Cultural Gallery in Oakland, came after I had spent two days in bed with an excruciating and blinding migraine, the cure for which was found from an astonishing tuba-piano-sax-drums quartet that tore through the entire history of jazz in a 2 1/2 hour set, the likes of which I have never seen repeated anywhere else. I won’t say my experience in Augusta rocked my world in quite the same way, but it did result in an evening at the Library and day of visiting religious sites there that I will never forget, and for which I’ll always be grateful. After arrival, I made my way in my rental car from the hotel towards the downtown area. I had meant to check my map to see where the Augusta National Golf Club (where The Masters is played) was, but had forgotten to do so. Never fear — as I drove on the street that empties into John C. Calhoun Expressway — yes, that John C. Calhoun — the massive green ivy walls protecting the former indigo plantation that is the Master’s course appeared before me. 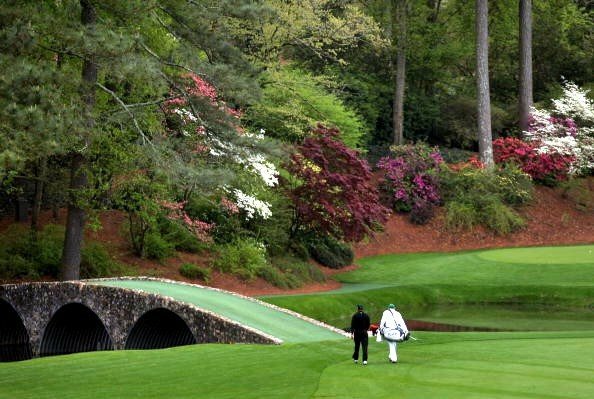 I got in the right lane, looking to see if there was any place to turn in and sneak a peek at any of the famous holes — heck, maybe I could get lucky enough to see one of the most sacred sites of all: Hogan Bridge, in the middle of Amen Corner, leading to the 12th green. But no, a mighty fortress is The Masters, and the ample security in and around the facility is there to make sure loiterers like me don’t hang around long. I was so busy trying to sneak my way into the course that I missed the entrance to the Expressway and instead continued down Broad Street, which quickly emerged as a lengthy row of dilapidated shotgun houses and abandoned former mill houses and small plants which reminded me of neighborhoods I have driven through in the Mississippi Delta, or some parts of other southern cities. Between The Masters and Broad Street, I was getting a sense of the book-ends of this place, and a little parable of economic inequality in American history and in the American present. Arriving at the library, I was given a tour of what is a beautiful new facility there, and some time later met the moderator, Jeffery Thomas. He was a native of Augusta, who had gone to college there, went to Claremont in Los Angeles for his Ph.D., and had returned to Augusta to pastor a historic congregation. He was also serving as a Professor of Religion at Paine College, an institution I had researched previously for a portion of chapter two of Freedom’s Coming. We immediately fell into a fascinating conversation about various black congregations in the city, and in particular of the history of his own, Trinity, which emerged from a long relationship with a local (white) Southern Methodist Church. Dr. Thomas had come prepared with questions for me, and as we began, an audience primarily of local African Americans (many from his congregation, I believe), and a few folks from Georgia Regents University (formerly Augusta State University — including my longtime friend John Hayes) listened as we went back and forth on various questions of religion and race in American history. He was a gracious moderator, but had his own strongly held views on the subject and freely interjected them, which only enlivened the conversation. It became evident that while my favorite word is some variation of “history,” his was “subjectivity,” apropos of his training in the psychology of religion. Following an abbreviated lecture I gave about “Suffering Saint: Jesus in the South,” the dialogue began. The crowd, as it turned out, featured some very devout folks who were a bit uncomfortable with some of what I had to say, some religious liberals who wanted me to condemn the religious right, some freethinkers who just wanted me to condemn religion period, and some academics who queried me on specific points of my talk as they would do at a conference. At one point, the microphone went to an older woman in the audience, who, in a very kind and friendly but determined fashion, gave me a piece of her mind about various points with which she took issue with me. There was some good-natured laughter after her peroration, and the moderator Dr. Thomas immediately said, “I just thought I should mention, the person who just finished talking is my mother.” I learned after the talk that she had been a schoolteacher in Augusta for many years, and it was evident that she wasn’t going to let some upstart out-of-town professor from someplace dissuade her from her views. I completed the evening with some book signing (the way to an author’s heart is through a book signing), great conversation with various audience members, and a lengthy catch-up conversation with Nancy Bristow, a professor of History at the University of Puget Sound whom I had gone to graduate school with but hadn’t seen in something like 20 years; she happened, by the most bizarre of coincidences, to be in Augusta for a few days, and had just happened upon a flyer for this lecture. These moments of serendipity were building. Following the evening at the library, I went with my friend John Hayes (whose book-in-progress may be previewed here in the form of the article “Hard, Hard Religion: The Invisible Institution in the NEw South,” and whose great piece on Johnny Cash graces the new volume Gods of the Mississippi edited by our own Mike Pasquier) and one of his colleagues, walking a few blocks through some desolate streets only to stumble upon a couple of blocks of hipster eateries and the like that would not be out of place in Durham. We shared tapas and great conversation, and agreed to meet up the next day. John picked me up the next morning and for the next few hours took me around on a rather amazing tour of southern religious history within the space of a couple of miles of Augusta. We started at the oldest (or second oldest, depending on whose history you believe) black Baptist church in the country, the Springfield Baptist Church, home after the Civil War to the Rev. William Jefferson White (a personal hero of mine) and to a school in the basement which eventually became Morehouse College (now, of course, in Atlanta). It’s always kind of amazing when places you have written about extensively but have never seen suddenly appear before you. Out of Springfield, as well, emerged several other early black Baptist churches in the area, a couple of which we drove by later in the morning. By the fathers of our common Country. We then made our way to the original church building where the Southern Baptist Convention was established in 1845 — and if you know anything about my scholarship, you will recognize that’s a site I should have (but haven’t) seen a long time ago. The building remains fairly simple and beautiful, but is abandoned, the Baptist church there long since having fled for the suburbs (I gather it is rented out periodically for other events, but not regularly used). If I’m not mistaken it’s own by a Baptist Historical Society (or Foundation, or something — maybe someone can give me the details), but besides the historical marker there, one would simply mistake it for another of Augusta’s downtown abandoned buildings. Nearby, I should add, is James Brown Boulevard, and the Jessye Norman Center for the Performing Arts, both of these luminaries being raised in the city. (Brown’s family moved there from South Carolina when he was four). From there, we toured a beautiful and evidently very thriving Catholic church just caddy-corner from the former Baptist church (which featured, I’m happy to report, a plethora of white Jesus images), and then on to the Reverend C. T. Walker’s historic Tabernacle Baptist Church, getting towards the black neighborhood of the downtown area. But even more exciting (because unexpected) for me was the huge and architecturally fascinating United House of Prayer for All People (of “Daddy Grace” fame) church building, a structure with New York Public Library Lions on the outside guarding it, a paint scheme which might have come from a Moorish Science Temple, and a stone modernist exterior that gave it an imposing feel. I was dying to look inside — but alas, it was locked. For the remainder of the morning we drove around Paine College (the black Methodist college in town where some folks who appeared in my book Freedom’s Coming taught), the old mill village just a bit away from downtown, and some Holiness-Pentecostal congregations in the area. 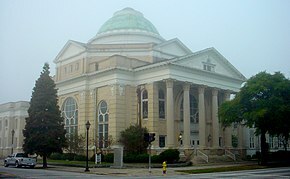 We saw the congregation that met in a church that in the late 19th century had literally been “rolled down the hill” for the villagers, a story recounted in the late and lamented young scholar Julia Walsh’s article “Rolling Religion Down the Hill.,” about religion and working-class politics in Augusta around the turn of the 19th/20th century. (I still miss Julia terribly). We then had organic and locally-sourced burgers at a very popular downtown spot, where the local congressman was working the crowd. I found my way back to the airport and back to Colorado Springs, happy and even exhilarated both by the lively conversation at the library, my meeting up with friends old and new, and by a feast of religious history within the spans of a few blocks of the downtown. He was, I have since learned, 49, 3 years younger than me. One of the last things he said to me concerned my picture of a black Jesus from the black Miami street artist Purvis Young, which appears in my book Moses, Jesus, and the Trickster in the Evangelical South. I had indicated that Young had passed from the scene just at the time of the flowering (and increasing value of) the work of self-taught artists, and that he had thus not enjoyed the true fruits from his labor. Dr. Thomas said, “but he was, actually, a wealthy man; it shows in the spirit of his work.” We agreed to stay in touch as I went back to work on my book-in-progress Trouble the Waters: Religion in the South from Jamestown to Katrina. Shortly thereafter, we shook hands and bid each other well and farewell. That could be the last time, maybe, I don’t know.